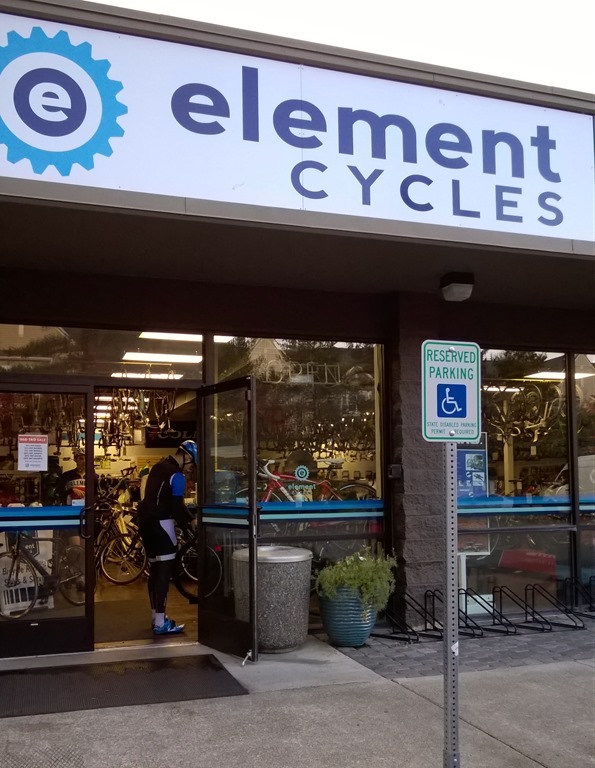 Although I said this is an all-Finnish-speaking blog, I’ll make an exception again, to respect my new friends at Element Cycles in Redmond, WA. I had earlier got familiar with this bike shop during one of my previous visits in the town. I was so impressed with the high quality of this shop and the friendly staff, that it was obvious I paid them a visit as soon as I landed. This time I left the shop with a Canadian carbon-framed rental bike with Shimano 105 parts. Nothing fancy. The alternative was a Pinarello Dogma, but the rental price was double. The bike made me company in my hotel room, as before. And early mornings/late evenings I was able to explore the surroundings a bit. The already familiar trail by river Sammamish, of course. But this time I also took advantage of Strava and downloaded to my phone a GPX file guiding me round lake Sammamish. Pretty neat 40 km ride, mostly flat terrain and heavy car traffic – we were in USA after all. But the sceneries were beautiful, road surface good, and bike lanes / road shoalders generous. The sun was shining warmly (when it was up). Very unusual for the Seattle area in October, or any other time of the year for that matter, I’m told. My most devoted bicycling comerades will be devastated by my next confession: I skipped cycling on Friday and attended a running event. The well-established truth is that a true cyclist only runs at cyclo-cross. But as my friends at our San Diego –based silicon supplier company got more an more braggy about their running condition and demanded to place bets, I couldn’t help but to commit to running. As the start line became closer, our friends weren’t that confident any more. 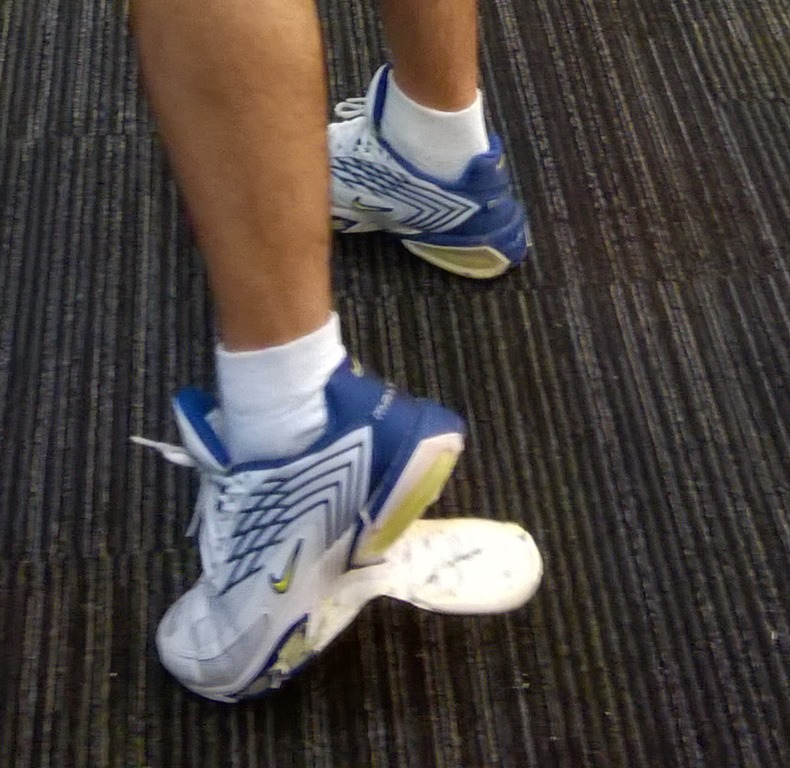 To the extent that one athlete ‘accidentally’ broke his training shoe when walking on carpeted office floor! 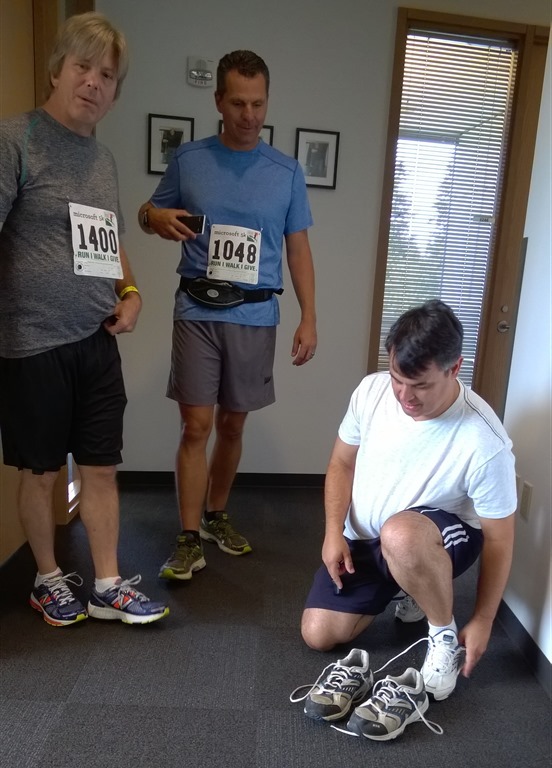 Of course my Redmond-based colleagues had anticipated all kinds of tricks and had a spare pair of running shoes available as a replacement. The run in the end was a success on all accounts. 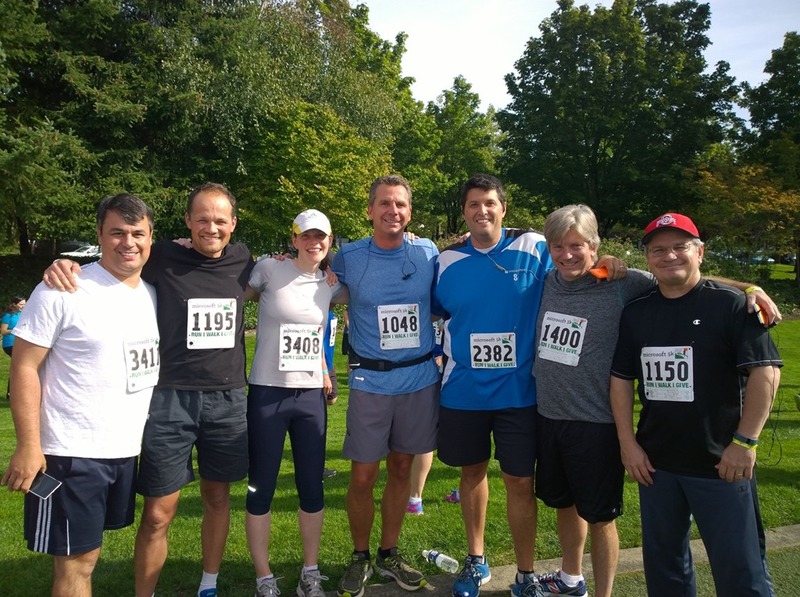 We all finished the 5k (= 5 km) run, amongst almost 2700 other colleagues, friends and family. 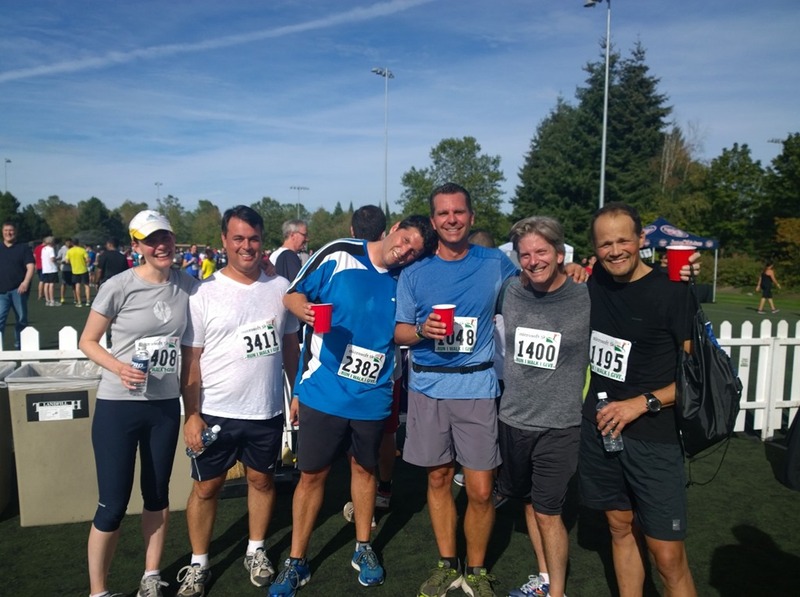 Many of us achieved their PB, some (=almost all) having never run a timed 5k before. For my part, I was pretty happy with my 23 min 14 sec time, considering I ‘ve barely run this year, and my age. That is until I wrote home to brag about it and learned from my wife that my son does the same distance in 16 minutes. But boy, are these Americans messed about the distance measurements! I hear they measure running distances in kilometers, hence the ‘5k’. When I was in the race and reached the signpost labeled ‘1 (one)’ , I logically thought I had just passed the first kilometer and was devastated by the time it took, considering my exhaustion. Then I realized it was the one mile signpost. I think I have to move to the U.S. and convert the nation entirely to using the metric system. And the week numbers. And the logically ascending order in date formats: dd.mm.yy. Back to cycling. Come Saturday morning. Come the Element Cycles 07:30 (or approx. 7.30 a.m.) group ride I had learned about on Friday and decided to join. 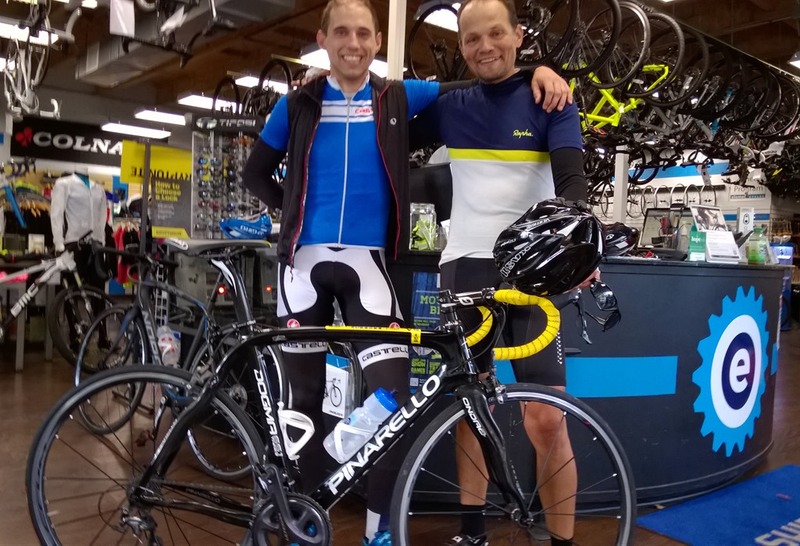 It turned out I was the only client and the other two – James and Tyler – were bike shop staff, i.e. professionals. James riding a gorgeous Pinarello Dogma and Tyler a pro-peloton-ready BMC. Anyway, we dashed off at roughly to the minute. The guys were really friendly wi th me, adjusting their pace with my ability. And at points pretending to be left behind at the climbs. All Americans are natural salesmen! James taught me his favourite route. It was about 60 km (or I don’t know how many miles) and it was fabulous. Some really steep climbs (cat 4), and very enjoyable descents. Actually noticed I maxed more than 80 km/h in one of them. At places the terrain was flat and I could have mistaken the countryside to Sipoo, had Mount Reinier and the other mountains not been looming in the horizon. The road surfacec were again in top condidtion, thank to the countless tax-paying IT millionaires living in the neighbourhood. Having completed the bike run, I left the rental bike in the shop and walked back to the hotel. Almost got lost, as meanwhile a market place had been established on the way. 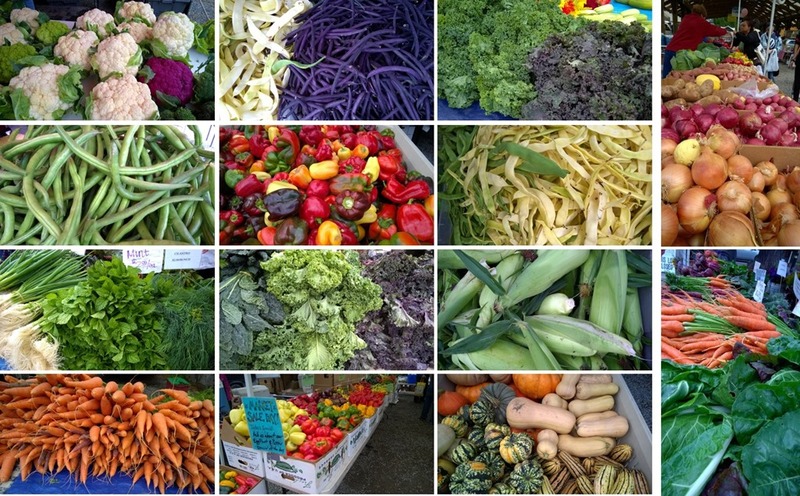 Good time of the year to enjoy the colours of the fruit and veggies the local farmers were selling there. Next I moved house to downtown Seattle. 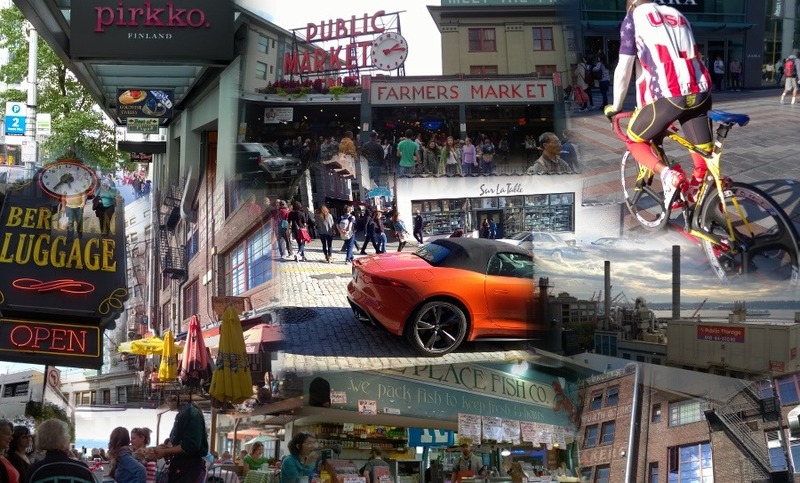 Quite exceptionally, on this visit I had time to stroll around the streets, lunch in funky places and then as the top attraction, attend on Saturday night a colleague and his wife’s birthday bash at Pioneer Square. The following day, prior to departure, I signed in for the ‘Underground Tour’ tourist attraction which I warmly recommend to anyone interested in Seattle / Wild West history – or just keen on hearing the fun jokes from the tour guides. Kuva | Kategoria(t): Matkakertomus, Reitit Avainsana(t): Dogma, Element Cycles, Pinarello, Redmond, Seattle. Lisää kestolinkki kirjanmerkkeihisi.